First Sentence: He stood just in the entrance of the cell, a tall man with his hat in his hands. 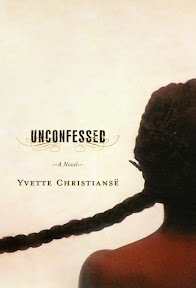 Reason for Reading: When selecting a book to review for Curledup.com, I came across Unconfessed and was immediately drawn to the novel. Comments: Unconfessed is Sila's story, the tale of one woman's pain and suffering. It is the story of a mother's love, of desperation, and the cruelty of slavery. Yvette Christiansë's haunting tale pierces the heart in this powerful novel about a broken and angry woman hanging on by a thread. However wounded, Sila is undeniably a strong woman. Convicted of murder on April 30, 1823, Sila van den Kaap (so named by her captors) escaped her execution once when she became pregnant with her daughter, Meisie. Living in filth and worse than a whore in prison, Sila is certain her time has come when the new superintendent appears at the door of her cell. However, with the changing political climate in the Cape Colony of South Africa and perhaps a bit of kindness on the part of the new superintendent, Sila's order of execution is commuted. She is to carry out a lengthy sentence on Robben Island, a prison known for its institutional brutality. As Sila toils in the quarry, breaking stones that will be fitted for the roads of Cape Town under the watchful gaze of guards, and occasionally working in the warden's kitchen, she reminisces about the past, reliving the horrors she has been forced to endure all her life, as well as the scarce slivers of joy that seemed to come and go so quickly. Sila has little memory of her life before being forced into slavery. She is shuffled from house to house like property, going from the Neethlings, a pastor’s family whose debt forces them to sell her to the Oumiesies (old missus), Hendrina Jensen, who promises Sila and the other slaves in her care freedom upon her death - only to be denied freedom by Oumiesies’ son, Theron. From there she goes to Hancke, another who promises her freedom once her debt is paid off, and finally to the vicious Jacobus Stephanus Van der Wat. Beaten, raped, stripped of her identity, and robbed of her children, Sila, like so many others who walked in similar shoes during that time in history, has little to hope for. Freedom is something she longs for, has been promised and denied her before she has a chance to taste it. Still, it is that dream that keeps her going - that and the hope of reuniting with her children so that they can all live as free people together. Final Note: Unconfessed is not the type of book that will leave the reader with a sense of resolution or happiness. It is a tortured and sad novel that is full of pain and suffering, with a scattering of laughter and a hint of hope if you look close enough.